The process of choosing a new home is an exciting moment during your homebuying journey. There’s a lot of decisions to make; from selecting which city and neighborhood you want to live in, to the features you must have. But one of the important decisions is selecting the right floorplan to fit your family. The floorplan can affect how you experience your new home so it’s crucial to pick one that fits your lifestyle. Here are a few helpful factors to consider when choosing the right floorplan for your new home. When it comes to homes, one size definitely doesn’t fit all! Selecting the right floorplan starts with deciding what size home you need to comfortably fit your family and lifestyle. Figure out how many bedrooms and bathrooms you’ll need to accommodate your family and any potential overnight guests.While you may have a specific square footage in mind, go into home shopping with an open mind. Some floorplans can be numerically smaller than your preferred square footage, but still feel larger thanks to an efficient design that makes better use of the space. Your floorplan will be dictated by the style of your home. Do you prefer a single-level home, or is a multi-story home a better fit for your family? Detached or attached? Single-family or townhome? Decide which home type you prefer. Do you want a first-floor owner’s or guest suite? All these factors should be considered. 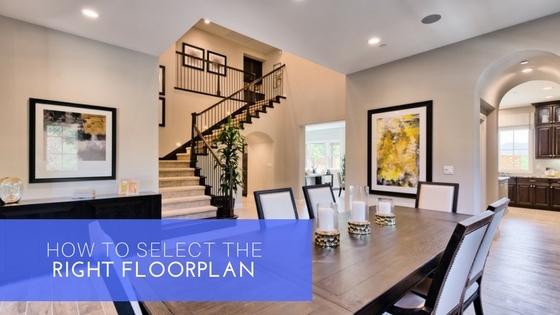 Tap into your design preferences to find a floorplan that meets your needs. If you prefer a more traditional plan with defined rooms, an open floorplan is not your best bet. If your design sensibility leans more modern, an open floorplan is a sound decision.Open floorplans are decidedly popular at the moment, so when considering this type of plan, it’s important to think about how the areas connect. Does the flow make sense for you? Try to imagine how your family will move around in this space. When touring new homes, be sure to base your decision on how well the layout flows and if it feels functional for the way your family lives. Try not to be distracted by the upgraded amenities (or lack thereof); these items can always be added later, however it’s extremely difficult to make chances to the layout. Ultimately you know what you want and need in a home to best suit your family. Be clued in to your instincts and see what speaks to you. It sounds hokey, but countless homeowners have said they knew they found the right home because it “felt right” as they walked through. In the end, its important to ask a lot of questions when touring homes. As long as you’re honest with yourself about what your family needs, and open to possibilities, you’ll be sure to find the right home.